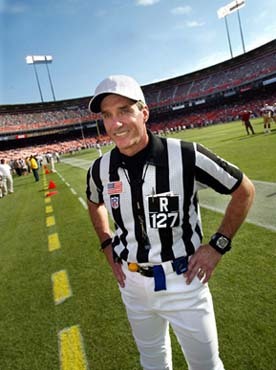 Bill Leavy is an American football official in the National Football League (NFL) since 1995 and is a retired San Jose, California Police Officer and Firefighter, serving for 27 years. Leavy has thus far been assigned to eight playoff games and two Super Bowls in his NFL officiating career. He was selected as a back judge on the Super Bowl XXXIV officiating crew in 2000 and most recently headed up the Super Bowl XL officiating crew as referee in 2006. He wears the uniform number 127. Leavy is a 1965 graduate of Santa Barbara High School in Santa Barbara, California and a 1970 graduate of San Jose State University in San Jose, California where he earned a degree in law enforcement. Just before earning his degree, he joined the San Jose Police Department in September 1969. During his high school and college years, Leavy’s athletic interests included swimming and football. In December 1994, Leavy received a call from then NFL Supervisor of Officials, Jerry Seeman, that he was selected as one of 12 finalists for open positions beginning with the 1995 NFL season. On March 27, 1995, Leavy was hired by the league as a field judge. Leavy’s first game was a pre-season matchup between the Dallas Cowboys and Buffalo Bills at Texas Stadium. For seven seasons, Leavy worked as a field judge and later as a back judge, when the league swapped position names in 1998, before being promoted to referee for the 2001 NFL season. This opportunity at the referee position became available as a result of Phil Luckett returning back to his original back judge position due to the time commitment that is involved to be a successful crew chief. Bill and his wife, Cheryl, live in San Jose, California.